Don’t worry about when your service is due. We’ll keep track of it for you. Our service management program will track your service requirements so your annual inspections will be scheduled and completed on time. We can even do your required monthly inspections! 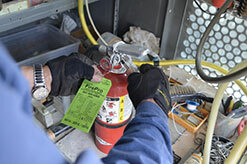 Our certified technicians sell, install, recharge, and maintain all types of commercial fire extinguishers. Although we primarily work with commercial and industrial entities, the public is always welcome to stop by our location and select a new fire extinguisher for home, auto or boat or to have one serviced. We adhere to NFPA 10 Regulation Standards. NFPA Regulatory Requirements ensure that portable fire extinguishers will work as intended to provide a first line of defense against fires of limited size. Protect your property and stay in compliance with a no-obligation review of equipment and maintenance.